Obstruction to your bowel is often referred as intussusceptions. One segment of the intestine slides inside the other segment and this leads to blockage to bowel movements. The main prone area for intussusceptions is the junction where small intestine and small intestine meets. An abdominal injury is often found preceded with inflammation. Your intestinal blood supply can also be blocked creating a tear in your bowel, eventually leading to tissue death. Children less than 3 years are most prone to this and in most of the cases, it is a medical emergency. Male genders have more likeliness to intussusceptions than girls. A polyp or tumor is the main reason in adults to begin with intussusceptions. Its presentation can be anywhere in the intestines (both small and large) with more inclination to the colon part. Severe abdominal cramps with periodic episodes of pain and no pain, which is clocking in fashion. The painful episodes lasts for about 15 minutes and painless for an interval of 30 minutes. Often children compress their chest to knees due to severity of pain. The cramps are caused by the compression of blood vessels and nerves. Diarrhea with rectal bleeding usually mixed with mucus. This often has a jelly consistency. According to the view point of Ayurveda, in an obstruction imbalance of vata is at its peak. The deranged movement of vata causes you with serious impact. 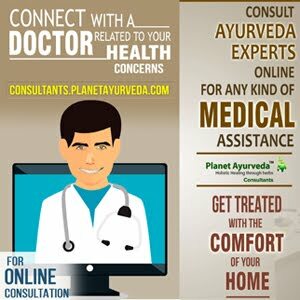 Planet Ayurveda offers wide choices of formulations that can be used for the betterment of life quality of the patients. They are 100% herbal and standardized, with no chemicals to preserve. Digestion support helps to balance all the tridosha – vata, pitta & kapha - & to digest the ama. Dosage: 1 to 2 capsules twice a day with lukewarm water after meals. Triphala powder is a very common mixture of Terminalia chebula (Hareetaki), Terminalia bellerica (Vibhitaki) and Emblica officianalis (Amalaki). It is an excellent remedy for every ailments of your body especially the gastro intestinal tract. Dosage: 1 tsp of powder mixture with lukewarm water to be consumed in the evening. Always check for hydration level. As vata is more aggravated, follow a kapha inclined diet, as the kapha can lubricate your intestine. This will certainly help you get a relief from the symptoms. Lady’s finger, water melon, coconut etc should be included in the diet. Fries and dries are better avoided. Include more fibers in your diet, which is very beneficial to cleanse your gastro intestinal tract. A treatment protocol is prescribed on the extent of disease and the present health of the patient. 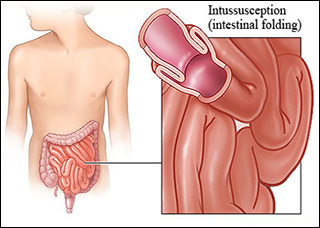 A severe condition of intussusceptions often requires surgical interventions. Undiagnosed and untreated intussusceptions can complicate you with internal bleeding or peritonitis (abdominal infection). So consult your physician as soon as possible and be regular with your follow ups.